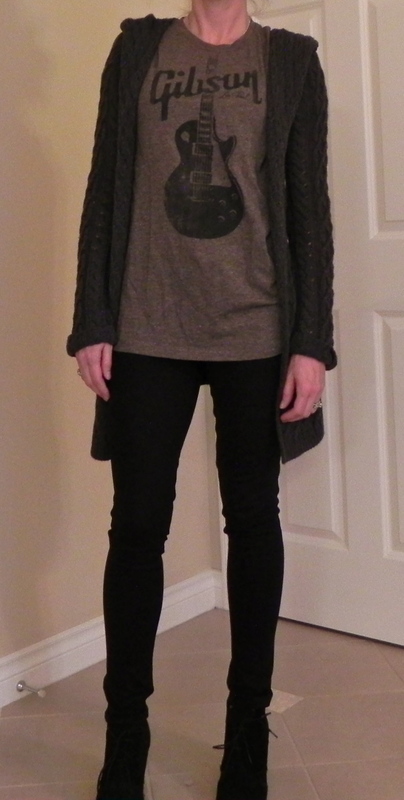 I’ve opted for black skinny pants, black booties and a funky t shirt under a cableknit cardigan. I NEVER wear t shirts like this, so this is a bit of a stretch, but my hubby liked it- and in the end, that’s all that matters, right?! I actually bought this t shirt for my son, but I stole it from him! You look hot!! Rocker chic definitely works for you. Thanks! I think Rocker Chic is my alter ego! I really love the way this looks- yet not for everyday- just every now and then it’s fun!